Pretty much everything you touch or interact with on a modern car has been rethought, re-engineered, re-designed, re-focus grouped, re-everything’d, over and over. With one notable exception: the sun visors. There hasn’t been any substantial upgrade to these surprisingly important bits of equipment since we started slapping illuminated mirrors on them in the 1950s. It’s time to rethink sun visors. I was reminded of how much we needed to rethink sun visors just the other day, when I was driving Westbound around sunset. As anyone who has done this or driven East in the mornings can tell you, you’re effectively blinded by the hot, bright, vengeful sun, and, for alarmingly long stretches of the drive, the sun is in a position far out of reach of most cars’ sun visors. 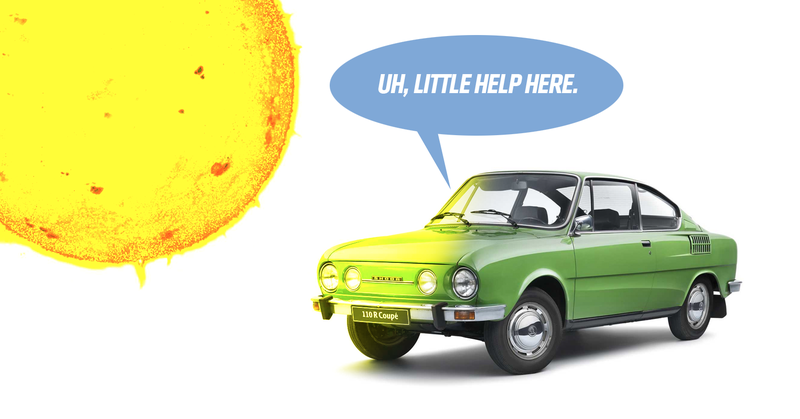 Solar glare is a serious issue when driving, as it impairs visibility dramatically. One study pegged the number at 3,000 accidents per year were caused by solar glare in the UK. An NHTSA study found that sun glare was the cause of 16% of atmospheric-condition-related accidents, with about 8,700 recorded from July 2005 to December 2007. That’s a lot of wrecks. Part of the problem is that the absolute worst times for the sun to be positioned low enough to make your visors useless it happens to coincide withe the busiest rush-hour times: sunrise and sunset. This is a real problem, and most sun visors are not up to the task. If you’re like me, sometimes you’ll solve the problem by raising your fist to block the bright disk of the sun, making a sort of tiny, manual eclipse. It helps, but it’s awkward, imperfect, and removes the use of a whole arm. So what’s a solution? Based on the effectiveness of the fist-eclipse method, we know that blocking the small area of the super-bright solar disc itself is effective; the trick is how to do it? I’ve come up with two solutions: an expensive, high-tech one, and a cheap, low-tech one. Let’s start with the high-tech one, which is based on welder’s mask technology. Have you seen those welder’s masks that instantaneously turn from clear to nearly-opaque when the mask senses the light of the welding spark? They’ve been around for years, and they sell for under $40 or so now. The technology is well-understood and very mature. Yes, some area of the windshield would be rendered opaque, but that’s far better than your entire field of vision being dazzled by the intense light of the sun. The sensor system and quick-reacting LCD cells would allow the setup to work in real-time, tracking the moving sun, or, really, any source of painfully intense light. I think this could prove to be a very valuable safety feature. Sure, it would make windshields more expensive, but I suspect that the basic technology and manufacture of these types of LCD sensor glass are mature enough that it wouldn’t be out of the question at all for mid-range to premium cars. Remember, people are willing to pay thousands for special paint colors, after all. 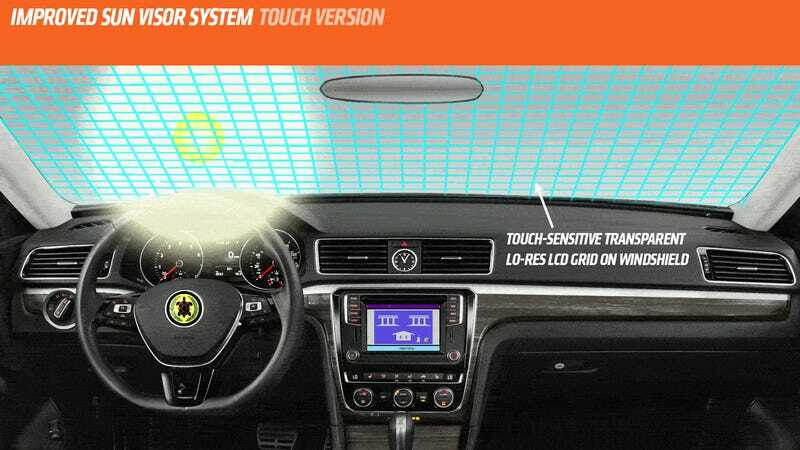 Personally, I think sensors would be better, but touch control is certainly possible, and has the benefit of letting you draw crude pixellated pictures on your windshield, if desired. Now, if you still think the welder’s mask-type solution is too complex or expensive, I understand, and I’m here for you. I don’t want to leave anyone out, especially when it comes to such an important driving safety concern. 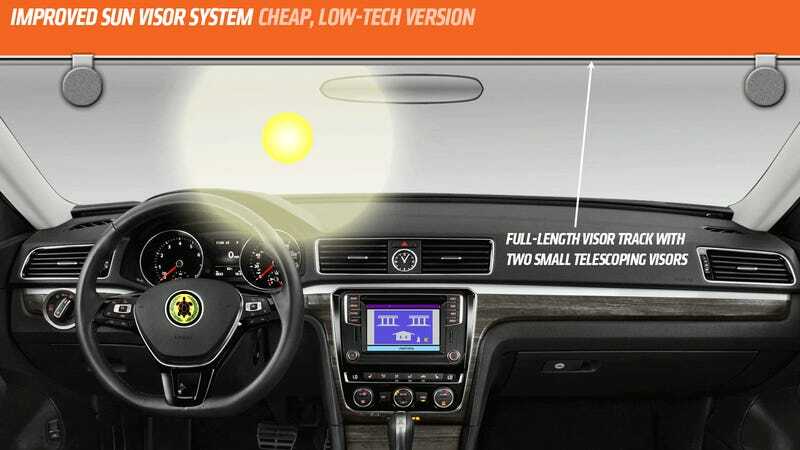 This system could work in place of or in addition to conventional sun visors. I’m imagining a system with two small round sun-blocking visors, set into a horizontal track above the windshield, that runs the width of the window. Each visor is set on a telescoping shaft that allows it to be pulled down to at least 3/4 of the height of the windshield. The combination of the sliding track on the X-axis and the telescoping shaft on the Y-axis should give the sun-blocking visors the ability to be moved to any location on the windshield that needs to block the sun. It’d be clunky, sure, but it would do the essential job, I think, and it’s still far better than what our conventional visors can do. I’m sick of squinting into the glare of the sun, trying to block the light from that fusion-powered ball of fire 93 million miles away with my tiny, stupid fist. There’s no reason sun visors should be immune to the constant cycle of improvement. As always, investors, you know how to contact me: walk outside and scream TORCH TORCH TORCH until someone gives you my email address in exchange for shutting the hell up. What&apos;s The Worst Thing You Can Put On Your Car?